Six of us gathered in the now-traditional meeting spot at the western edge of Euston Station for Northampton CTC’s third annual London sightseeing and tourist ride. First off to Primrose Hill and Cecil Sharp House, home of the English Folk Dance and Song Society, and a quick rundown on how Morris Dancing, as well as folk music, was kept alive in England (mainly, it turns out, by luck!). But Ian M had also woven some political history into this ride to complement the cultural history so our next stop in Primrose Hill was Friedrich Engels’ old gaff, where the man regarded by Lenin as the finest scholar of the modern proletariat seemed to entertain all and sundry in a most bourgeois way. And since Engels was living a mere ten minute walk from Karl Marx at the time, we headed next up to Maitland Park where Marx’s old residence has, somewhat fittingly, been removed to make way for social housing. 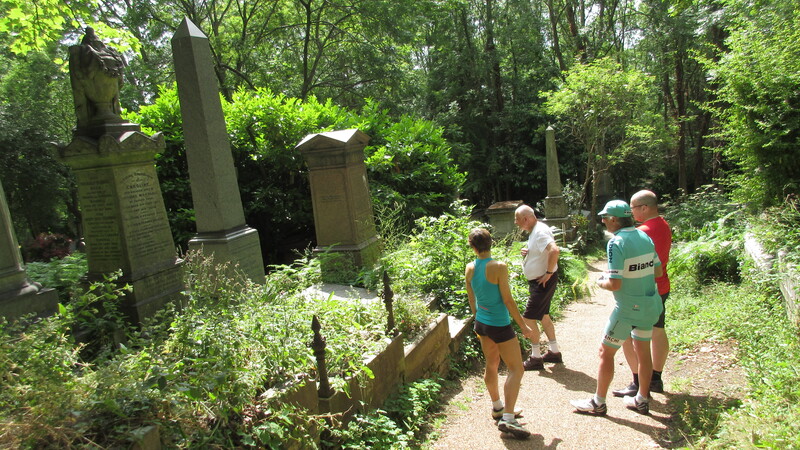 Moving north again, we made our way up – and I do mean up – to Highgate where the cemetery hosts not only Karl Marx’s tomb but that of many other political, and literary, figures (Eliot, Adams), so we went in on the political thread and came out on the literary one. And up the rest of Swain’s Lane (and I kid you not, I saw the same rider passing the cemetery when we came out as I did when we went in. Have these people nothing better to do with their day? 😉 ) at the top of which Ian M had laid on a twofer. Two blue plaques on one house. Not only was the building the one-time home of Samuel Taylor Coleridge but J B Priestley moved in some time after Coleridge departed. Then on around the corner to A E Housman’s former residence where A Shropshire Lad was created. Returning down the hill – with some speed – we swept into Little Green Street, a road pretty much unmolested for the last 200 years and often seen on TV and film, and through to its modern equivalent, Ingestre Road, which doesn’t look half as photogenic. (That’s not to say it isn’t a pleasant place to live, of course). We headed next eastwards and southwards to The Emirates, Arsenal’s mega-stadium replacement for Highbury where suitable tribute has been paid to Northampton Town’s former manager Herbert Chapman, the first man (according to our leader anyway) to professionalise football management and who is responsible for a fair proportion of Arsenal’s silverware bringing, as he did, his lessons from Northampton to the management of Arsenal FC in the 1920s and 30s. We then retired for lunch in a nearby tavern. 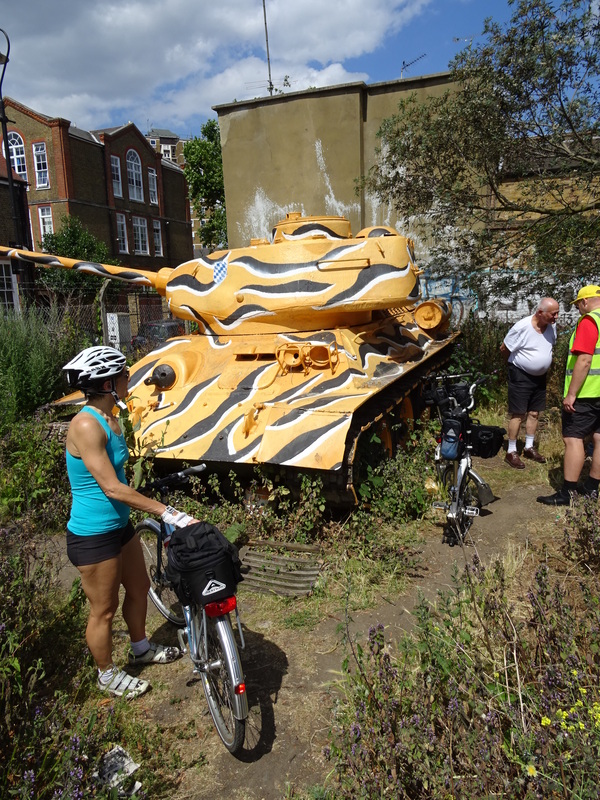 Our next port of call was south of the river, so we crossed Blackfriars Bridge after a short diversion and headed for a Soviet T34 tank parked just off the Old Kent Road and then across to Burgess Park. I doubt anyone outside of SE London has even heard of Burgess Park but with a café, toilets and Georgian almshouses surrounding a lovely bit of garden it’s a delightful place to take a break and catch some sun, of which we had plenty on the ride. From there we moved quickly to the Soviet War Memorial in the Imperial War Museum’s park and then on to the Surrey Oval (or Kia Oval as it currently is) where Ian M was able to regale us with a list of firsts: First test match, First FA Cup Final, First rugby international, etc.. And for those wondering why Surrey would play at The Oval in London, it wasn’t in London when it was built (1845) as the County of London didn’t pop into existence until 1889 (and Greater London not until 1965). Kennington was in rural Surrey at the time, something that’s hard to imagine now. We passed Battersea Power Station and Dogs Home without comment then were brought to a halt alongside Battersea Park by one of the Bromptons losing air, which cost us a bit of time but these things happen. 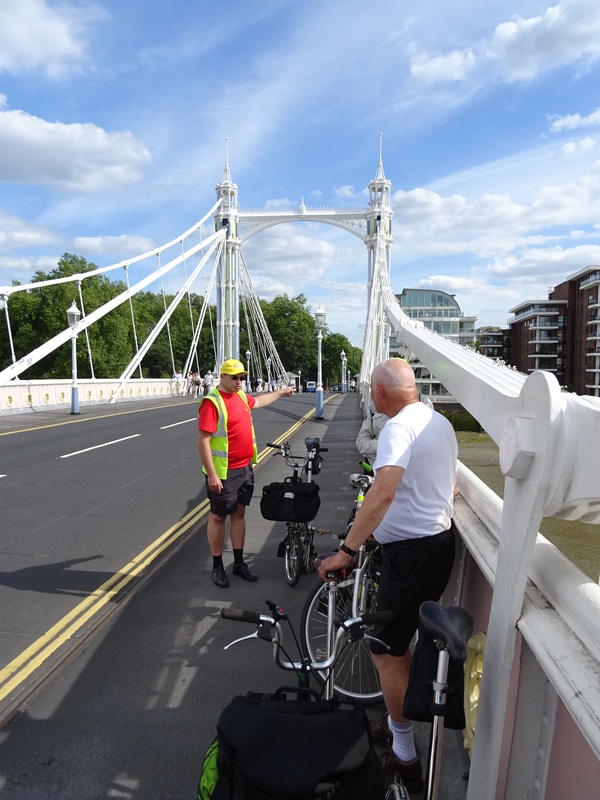 Once mended, we were able to continue onto Albert Bridge – a beautiful structure that’s been in trouble since it was built. It was reinforced with a secondary support system in its second decade of existence, propped up by piers in 1973, had a new deck in 2010 and currently has a two-tonne weight limit in the hopes that that may help the bridge survive a little longer. It really comes into tis own at night though, with thousands of lights covering its structure making it a tourist sight in its own right. Another twofer followed – our second football ground of the day (Stamford Bridge) but only briefly, and our second cemetery – Brompton, resting place of the suffragette Emmeline Pankhurst and epidemiologist Dr John Snow amongst others. 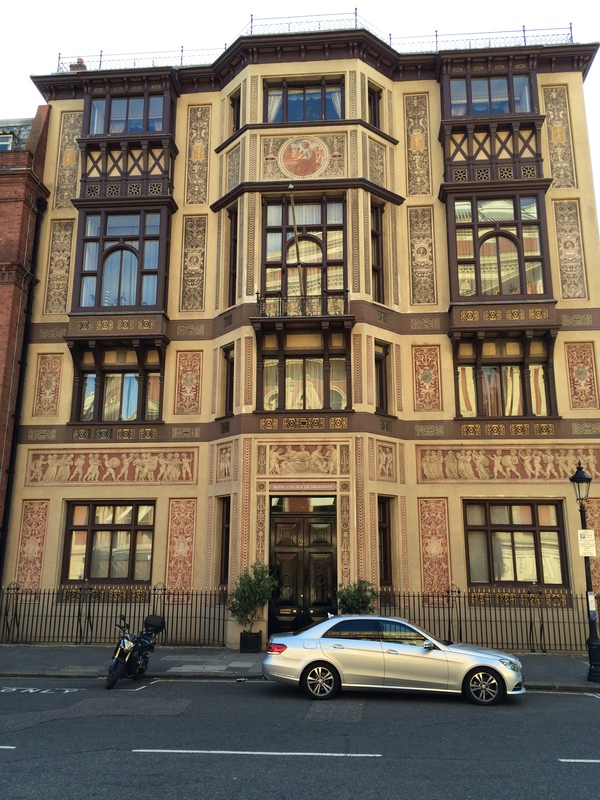 Then it was up towards Hyde Park for our last scheduled stop and one of the most beautiful buildings in London (in my opinion anyway): The Royal College of Organists, which sits right next to The Albert Hall and never seems to get a look in. 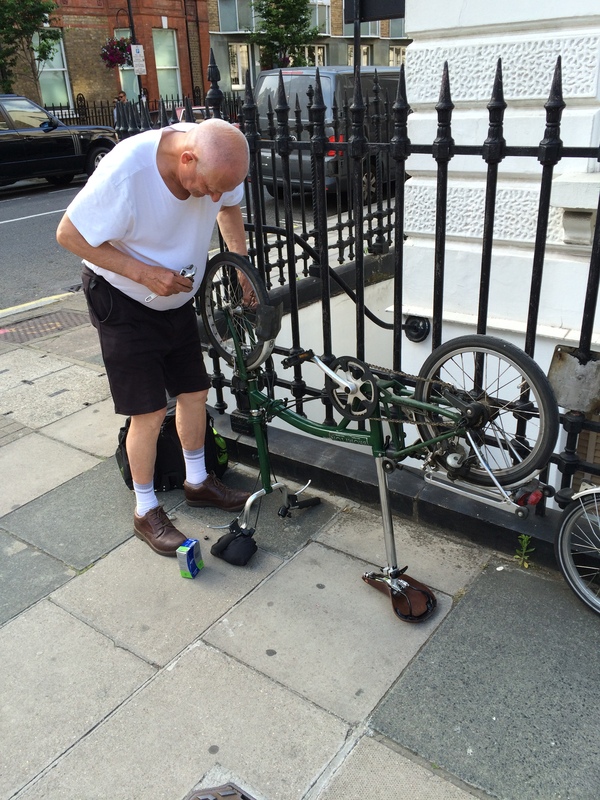 That concluded the scheduled sights and we made our way northwards towards the stations but turning off Marylebone High Street, one of the Bromptons made that hissing sound again. “Whoops!” thinks I, “We must have left the problem in when we changed the tube,” but no! this time the air was escaping the other end of the vehicle. How unlucky is that? Anyway, that delay meant there was little time to take in the scale of the Post Office tower as we shot past to meet trains before they departed but, as I said, these things happen. All in all, an excellent day out, well-prepared by Ian M and enjoyed by all. Three rides coming up: 27 June, 4 July & 12 July! A sight-seeing ride, north and south of the river, with plenty of stops for refreshments and photographs. Some unusual sights guaranteed! Finish: Back at Euston by 5.00 p.m. (but if booking a particular train home, allow for unforeseen delays). Organised by Kettering CTC, starting and finishing at Oundle. Options for 100km, 155km and 200km. Registration and a fee of £5 is required in advance by post – see www.aukweb.net for entry forms and for .gpx files of the three routes. This is an annual ride in memory of Guy Barber and a donation of £5 to the Headway Charity is requested on the day. It is a “Bike Week” event advertised nationally and there is usually good support from Milton Keynes and Kettering CTC groups. On the official first day of summer, four riders set out from East Hunsbury with a brisk cool westerly wind. We wound our way across to the A5 and over to Duncote, then Canons Ashby and on to our first visit to the café in the equestrian centre on the road approaching Woodford Halse. In the sheltered courtyard we enjoyed coffee and toast in the sun. 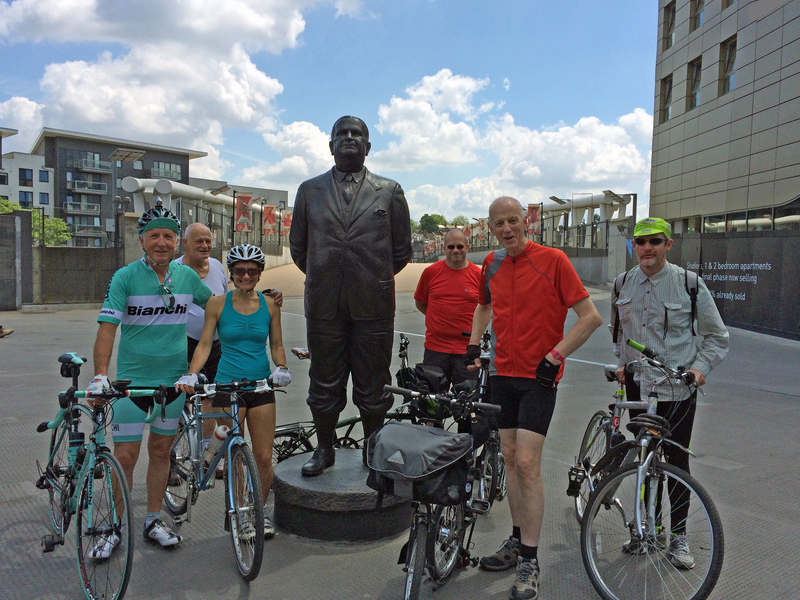 We had arranged to meet Geoff from Wellingborough who joined us for the rest of the ride. John Dunkley arrived shortly after, just to join us for coffee. Priors Marston. To get out of the village there is a 12% hill and then we were almost at Hellidon where we enjoyed a light lunch in the pub. 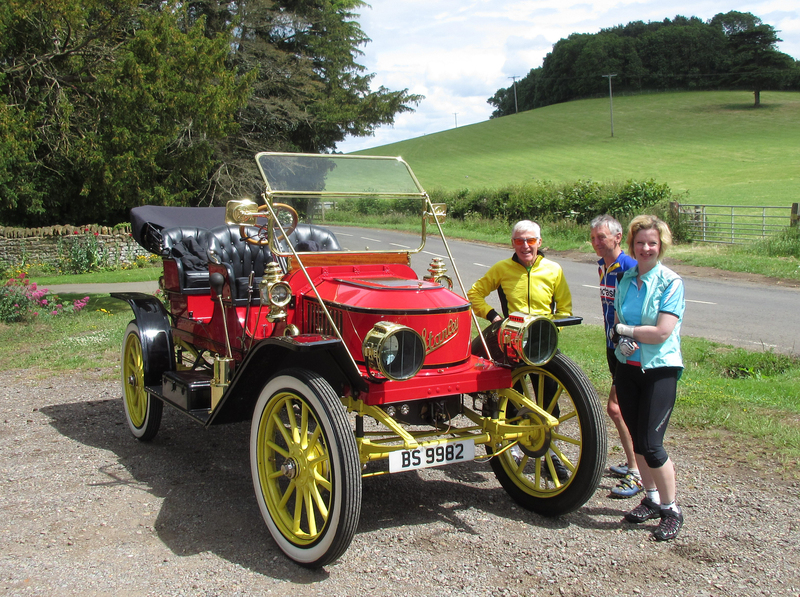 Whilst there, a steam car arrived looking vintage but with pristine bodywork. The give away was the disc brakes. It was, however, definitely steam powered – and an internet search confirmed it was a replica US 1912 ‘coffin nosed’ Stanley steamer. We finished a welcome break and given a strengthening tail wind we “steamed” back to Northampton again on exceptionally quiet roads and with the warm sun on our backs. It was 54 miles and quite hilly but the route took us through some of the most attractive parts of the County. A great day to be out on a bike and good company to boot with Rowan, Ken, David and Geoff! All members and guests are very welcome to join us on our annual London ride on Saturday 27th June! This year’s route is “North and South”. We will visit two cemeteries – one where old folding bicycles go to die, two premiership football grounds – one with an important Northampton Town connection, a test cricket ground, fields and parks, a Soviet tank & a Soviet war memorial, a Georgian cobbled street north of the river, Georgian almshouses south of the river and a building whose façade puts it into one of London’s top ten architectural sites. And cross two Thames bridges. And a hill climb! Themes on the ride include Marx & Engels, Exmoor & Shropshire, and folk-dancing. – climb the hill half-way, visit the cemetery, walk back to the bottom. I’ll explain the choices before we set off from Euston. 2. A good train to catch from Northampton is the 0850 which arrives at Euston at 0949. 3. I’ll be at the meeting point by 9.30 a.m. to greet anyone who is travelling there by an alternative route or at an alternative time. Many thanks to Iain D for accompanying me on the recce! Any questions? Ask on this forum or phone 07960 302095 (which is also my number on the day)! Really hoping to see you – it will be a great day out! Quiet roads (apart from three very short sections of the A428) – so quiet that on my recce on Tuesday there were two cows on the gated road just north of Watford village! Elevenses at The Red Lion in Crick after 14 miles. There’s no teashop or café in the village but the pub opens at 11.00 a.m. and offers coffee and a small selection of cakes. (I had the coffee and walnut.) If we find we’re going to be early then Mary, the landlady, has offered to open for us at 10.45 a.m. and I’ll phone her from Long Buckby. We should be back at BVW by 12.30 p.m., allowing for the coffee stop. Questions? Contact Ian M on 07960 302095. Ride the Route of Stage 3 of the Women’s Tour of Britain with CTC Northampton on Sunday 7th June – starting at Oundle Market Square at 9.15 a.m. The race route, which runs to the north of the County, is through some of the best countryside in Northamptonshire. It is over mainly quiet and attractive country roads. Our ride will be a slightly abridged version of the route. This is a CTC Northampton club ride open to non-members and registered as a 2015 Bike Week event – http://bikeweek.org.uk/event/ride-stage-3-of-womens-tour/. Entry is free. 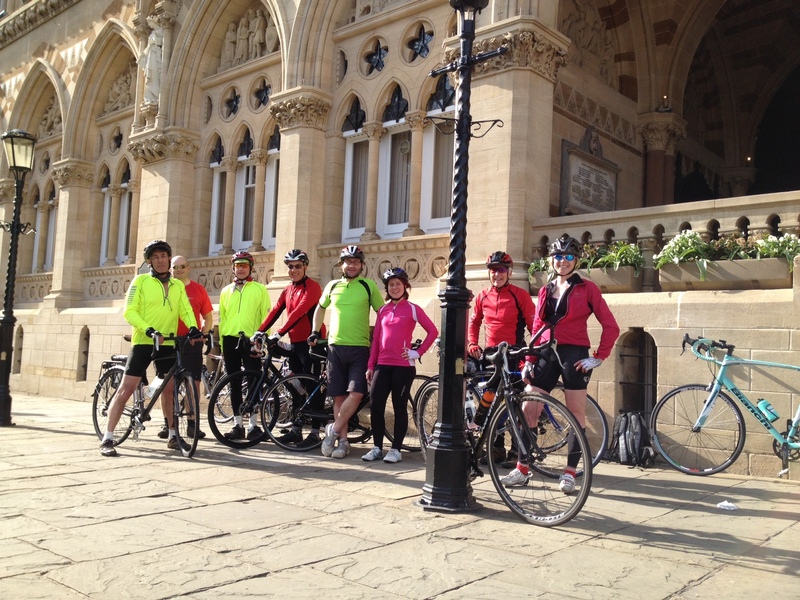 The ride starts at Oundle and ends at Kettering. The main ride will be 105 km (66miles), with optional self led variants of 115 km (72 miles) and 74 km (46 miles) towards the later parts of the route. The main group will expect to average 20 kph (13mph). There will be two stops along the way, at East Carlton Country Park (Coach House Café) and Kelmarsh (World Peace Café). For further details or to register for the ride please contact secretary@ctc-northampton.org.uk. Limited transport will be available at the end, from Kettering to Oundle, on a first come basis. Kettering to Oundle is 25 km (16miles). Some CTC members are planning to pedal back to Northampton either from Kelmarsh (after lunch) or from Brixworth (the nearest point on the route to Northampton) rather than continue to Kettering – and so, if you wanted to do this, you would have company. Car parking in Oundle is free. The car park is next to the Joan Strong Centre, PE8 4BY. From the A605 (avoiding the first turn at Barnwell which may have road works) take the A427 signed Oundle. Pass Gorilla Cycles on left. Take next left into East Road. Pass Waitrose, go across next roundabout and continue on East Road. Take next left just before another roundabout to the Joan Strong Centre (the Scout Hut on the left). The public car park is beyond the Centre on the left. Beware height barrier if cycles on the roof. Leave car park and return to East Road. Turn left to roundabout and then right along East Rd. At T-junction, turn right into St. Osyth’s Lane which leads to Market Place. The Coffee Tavern café at 34 Market Place opens at 9 a.m. If you have space on a car to transport a rider and bike, or if you would like a lift to Oundle, please contact secretary@ctc-northampton.org.uk. Contact details of riders wanting transport will be passed onto potential drivers offering lifts, with the onus on the driver offering the lift to make the first contact. Our route for 7th June can be found on RideWithGPS. A gpx file can be downloaded from this site by clicking on the “Export” tab at the top right). If you wish to discus the event please ring Brian Tunbridge (CTC Northampton Rides Secretary) on 01604 622073.